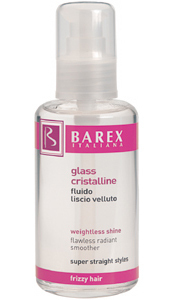 Clearly and decidedly, Barex Glass Cristalline guarantees a perfect smooth style for curly, frizzy and untameable hair. Protects hair from humidity while creating a radiant, glassy finish. Contains sun filters.